Discover the secrets of Mayan chocolate on a Flavors & Traditions of Mexico tour in Cozumel, which also features a tequila tasting and cooking class. For the Maya, chocolate wasn’t just a sweet treat - it was a sacred food of the gods. Learn more about Mayan chocolate when you sign up for our Flavors & Traditions of Mexico tour, and go on a culinary voyage to ancient Mexico. Ancient Mayans living on Mexico’s Yucatan Peninsula were the first people in the world to cultivate the cocoa bean and make chocolate. While their version of chocolate included only cocoa beans, chili peppers, and water - no sugar - it was a revered libation that was used in religious rituals. Images of cocoa pods have been found on Mayan temples, which show gods and kings alike drinking chocolate. But all Mayans could enjoy the bitter beverage, which was usually consumed during weddings and religious ceremonies. Chocolate was highly valued for its medicinal properties and was known as a healing remedy. Explore the ancient secrets of Mayan chocolate when you sign up for our Flavors & Traditions of Mexico tour. 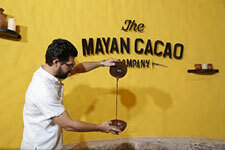 Visit The Mayan Cacao Company for a delicious chocolate workshop ever. Discover where chocolate comes from, how cocoa beans become candy bars, and why the Mayas believed this fruit was divine. This exciting tour also includes admission to Playa Mia Grand Beach & Water Park, a tequila tasting workshop, and a cooking class with an open bar where you’ll create an exquisite three-course meal of Mexican cuisine. Would you like to learn more about our Flavors & Traditions of Mexico tour? Please don’t hesitate to contact us today. Make your vacation unforgettably delicious.